They’re a hybrid between a croissant and a donut. And they’re currently very trendy, especially in New York. Looks like Chinese food containers, so is it some type of Chinese food? In Toronto, One of our yearly exhibitions were selling full sized Cronut burgers.. 100’s of people got violently ill from them. Toronto Public Health confirmed the jam atop the sandwich was contaminated with Staphylococcus aureus: the bacterial toxin that caused the outbreak. There good, but you gotta watch it sometimes.. you never know what your ingesting. I’m glad they’re not sushi (the idea of raw fish sounds horrible)! Cronuts do look somewhat like sushi, which I’ve never tried but would be afraid to eat since it’s raw seafood. and are they really that yummy or is it just the current hype? how can we get dominique to move to sf?! 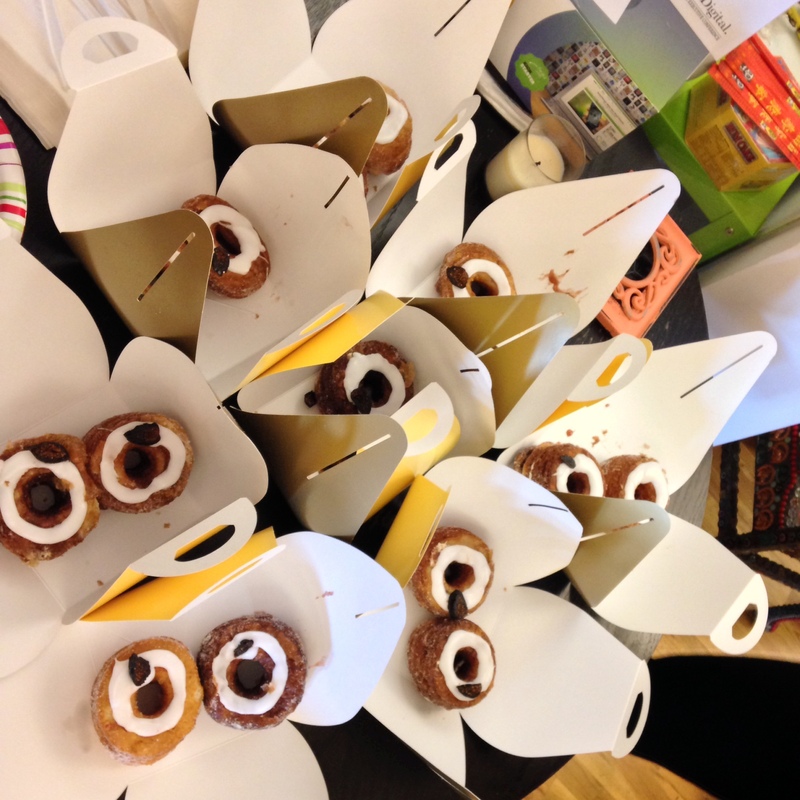 Some of our team members waited in line for 3 hours for those delicious things! They all agreed it was well-worth it! Love the packaging, can’t believe you were able to get so many! It looks like they only sell 2 at a time. It looks like either jelly or very large raisins on the top of the desserts. Are they going to be sold in other areas of the US as well? (I don’t live in New York). They must be very pricey if they only sell them in boxes 2 at a time)! It would be a great idea I think if they carried them in Dunkin’ Donuts restaurants across the US! When I 1st saw this pic, I thought I was looking at flowers, lol! They have just reached us here in New Zealand, and are a hit! My only comment with cronuts: just a bit oily (in general) due to its croissant base. Good nevertheless – and the craze is also enjoyed in the east (Manila)! I very much want to try cronuts!!! Sieht lecker aus könnte ich das Rezept haben. Did you get them from the Marriott? I’ve yet to try one. Do you know the best place to go in NYC to get one? I think the only authentic ones are from Dominique Ansel Bakery, which is in Soho. The word reminds me of “coconut”.